In 2017, Terese Refsgaard was out with her metal detector in a field on the island of Hjarnø in Horsens Fjord and struck lucky. In all, more than 32 pearls and pieces of gold have been found and the items are more than 1,500 years old, reports Politiken. 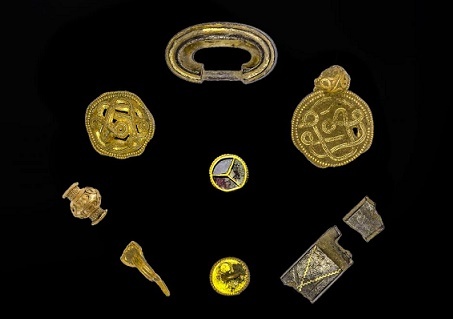 As well as the pearls, the items include pendants, a gold pin and pieces of gold cut up and used as currency. Refsgaards was delighted. “Us amateurs can go years without finding gold, and for some people it never happens, so this is really incredible,” she told DR.
Mads Ravn from Vejle Museum estimates that the gold dates back to the period just before the Viking era, so it was probably buried in around 500 AD. The find suggests that Hjarnø has had contact with the Roman Empire. “They’ve probably been down there on a mission to plunder, so our little find is a reminder of a turbulent period in world history when gold spoke its own, very clear language,” said Ravn. There has been speculation that the hoard could have been buried as an offering to appease the gods in order to head off a possible Armageddon. In 536 a violent volcanic eruption took place in El Salvador, resulting in a plume of ash that spread across a large area of the world. “It is tempting to conclude that the poor souls who experienced the ash cloud and the rapid climate change that came with it were desperately trying to avoid chaos, so the gold might have been an expensive offering to appease the gods that punish us,” said Ravn. Funded by the Carlsberg Fund, the Northern Emporium project is a co-operation between Aarhus University and Sydvestjyske Museer and has been going on for more than a year. It involves a total excavation of 100 sqm in the heart of Ribe, going down three metres below street level. The project has set new standards by using geochemical analysis, micromorphology and dynamic electronic documentation methods during the dig. Thousands of items have been unearthed, including pearls, amulets, coins, lost combs, gnawed bones and dog mess. Among the most eye-opening items were parts of a lyre complete with tuning screws. A number of runic inscriptions have also been found. Data and items collected by the project are still being examined and will provide work for archaeologists for decades to come.